I grew up in the Atomic Age, and loved those old nuclear disaster weird mutant horror movies like Them and The Incredible Shrinking Man and The Attack of the 50 Foot Woman, the Amazing Colossal Man, Tarantula, Cyclops, the list just goes on and on. 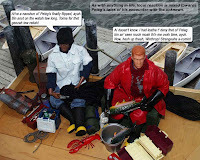 This is a photostory I did as a tribute to those great movies that also involves two of my other interests: action figures (specifically GI Joes) and sea kayaking. Just click on the thumbnails to get the full-sized picture. Enjoy! 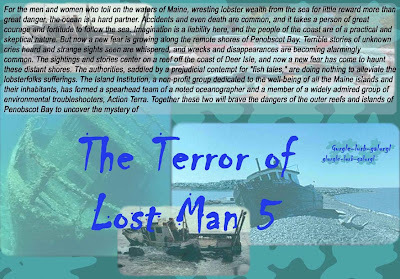 Beware the Terror of Lostman 5! The Beast attacks and Jasper is dragged down into the depths. Dr. Eden flees in terror, towing his companion's empty kayak behind him. 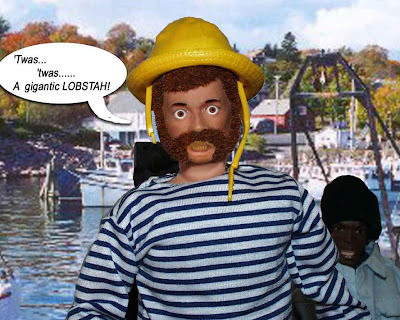 Returning to Deer Isle, he decides to investigate further. 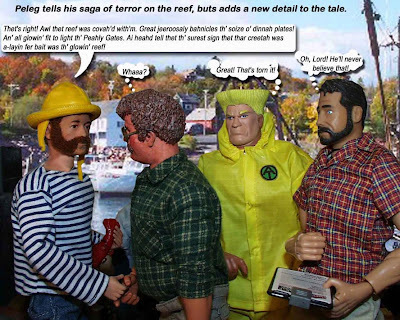 As he looks into the history of the Lostman 5, he finds evidence of malfeasance by the Nukeyoular Regulatory Commission in the early days of the Atomic Age, when barrels of radioactive waste were dropped into the depth off of the reef. The barrels began leaking their poisonous contents, with the result that bizarre mutations have begun to appear in the local sea life around the reef. Shaken by his discoveries, Dr. Eden retreats to a smokey dockside bar, where he meets a mysterious beauty who induces him to tell all. There follow several harrowing near-death episodes which convince Dr. Eden that someone is trying to stop his investigations by any means possible. 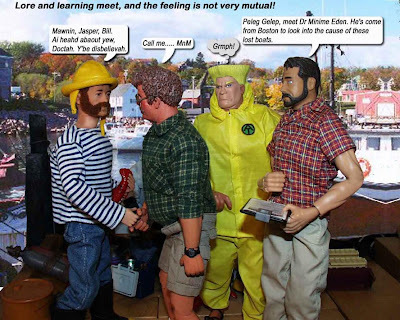 We find out, though Dr. Eden is still in the dark, that the "accidents" are orchestrated by a fanatic ex-regulator, the sinister Dr. Winsome Malafaque, who really wants to exploit the gigantic crustacean and corner the market on lobster salad. Dr. Malafaque is none other than the mysterious woman in the bar. She had noticed during her studies of the effects of radioactivity on sea life that gigantism was a common response of crustaceans to high doses of radiation and had actually engineered the illegal dump with the hope of developing a race of giant lobsters that she could then exploit in her mad scheme. 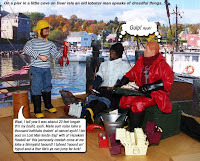 Avoiding death by inches, Dr. Eden is able to retreat to a local oceanographic laboratory and to develop a very powerful shell softener, which he hopes to administer with a harpoon gun mounted on the bow of a lobster boat. 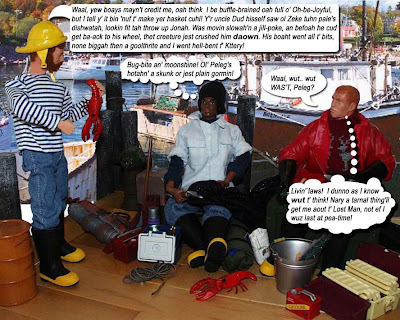 He recruits the "boys" on the dock, Red, Peleg and Billy, to take him out to the reef. Unbeknownst to them all, Dr. Malafaque has stowed away to try and prevent Dr. Eden from carrying out his plan. The boys chum the water with tuna heads to draw the Beast out. The creature arises from the sea, giving out its weird and terrifying ululation. Dr. Eden takes aim, Dr. Malafaque leaps out and pushes Red, one of the boys, into the water as she rushes onto the foredeck in an attempt to stop the poison from being administered. 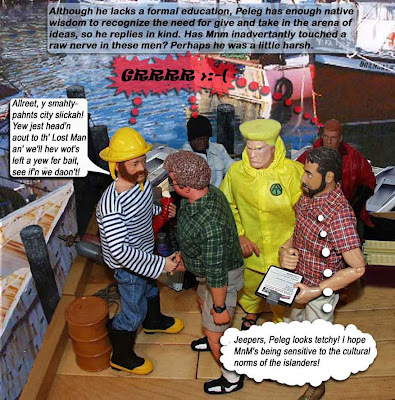 Red grips the side of the boat, but is dragged out of the arms of his friends as the try to save him from the horrid fate. In the meantime, Dr. Eden swings the harpoon gun around and fires, inadvertently striking Dr. Malafaque in the midriff. She is carried out of the boat and pinned to the side of the Beast, which has finished off Red and is coming back for dessert. The lobster begins to porpoise out of the water in agony as the corpse of Dr. Malafaque waves grotesquely with each leap. With a final shudder, the Beast sinks into the depths, where we see its outer shell dissolve, leaving nothing but 20 tons of delicious meat, with the skeleton of Dr. Malafaque pinned to it like a bizzare garnish. …when human beings write, we give ourselves the chance to put thinking on the page, to hold our thinking in our hands, to put our thinking in a pocket and take it out another day. When we write, we can think about our thinking…and we can think with others about our thinking. Or, as E. M Forster put it more succinctly, "How do I know what I think until I see what I say? " Writing for me has been for many years has been entirely a way a way of dispensing information, not as a creative outlet. My thinking and my creativity are more manual, sculpting, sewing, cooking and building, making things with my hands. My thinking is therefor shown in the things I make and what I do, rather than I what I have written. Metacognition is not something I have traditionally engaged in. However, since I started thinking about teaching as a career and working with students learning about how to decipher words on a page, both in reading and in writing, I have come to realize that to teach, I have to be able to express in words concepts that cannot rely solely on imagery and that must be able to be saved in some form that can be examined at another time and perhaps with others. Artists, both professional and life-style, have told me that the object is a sufficient repository of the thinking process, and that the intelligent viewer will appreciate and discern the artist's thought as he examines the object. This is, of course, the sort of malarkey you hear at gallery parties. While it is possible to discover meaning in a piece of art, the interpretation is often very personal and may entirely miss the artist's point, while still having total interpretive validity for the observer. “Words,” one might say,” can obfuscate or be open to misinterpretation as an ambiguous piece of art.” Yet it is true that, verbal as human beings tend to be, the best way to pass an idea from person to person is to explain it in words, and the best way to make it possible for more than one person to examine, think about and discuss the words or even to have them available to oneself at a later time is to write those words down. And once the words are on paper, it is possible to manipulate and refine them, to take whole chunks out and rethink and rewrite, to amend and append, to twist and mold the thought until it feels right or is wrong in just the right way. The act of writing then becomes a work of hand and mind together, art and science as one, a way of creating and thinking with blocks of words the way a child might build with blocks of wood, except that with the simple blocks of words, cathedrals greater than St. Peter's and edifices that could contain the world can be built. On the other hand, teaching this stuff to first graders seems overwhelming. First graders are still at the level of thinking magically. For them, the bounds of reality are far more tenuous than they are for me. Their thinking is belief, and is often so far beyond what an adult can believe. In some ways, teaching them the tools to express their thoughts brings them out of the magical universe and into a world in which thoughts can be reined in and put down in a readable format that other can understand. I feel very frustrated at the pedantic assignments that my kids were given during their early years of writing. While it is true that kids need to learn about what constitutes a proper sentence and how to write a friendly letter, I feel that forcing their thought processes into acceptable form is a mistake early in the writing process. Children should be encouraged to write about whatever they want, no matter how bizarre or incorrect, to get them to a point where writing becomes a natural way for them to express their thinking, as natural as speech. Once they have gained this point, they can start to learn how to use writing to HELP them think. Unless they are accustomed to writing as a natural way to express themselves, they will not be comfortable using it as a handy tool for thinking and communication. I can remember my daughter filling page after page in her notebook long before she could read or write, each row of scribbles carefully in the lines, She would then “read” her work to us. We encouraged her scribbling with much attention and praise. We did not try and teach her to use letters and to write words at first. She was a bit slower to come to reading and writing words than other kids in her early school years, but she has been a prolific reader and writer ever since she got the connection between her earlier scribbling and word-crafting. I believe that encouraging her to become comfortable with the process of pencil manipulation without insisting on having it “make sense” to an adult habituated her to the use of writing as a tool for communication. For a great page filled with quotes about writing, some serious, some very tongue-in-cheek, visit This site.